My husband is a very patient man. It's one of the reasons I was drawn to him all those (nearly NINE!) years ago, since I am very much not patient. He balances me out nicely. I bring this up because he's always been very tolerant of me and my antics in the kitchen. He doesn't complain when I constantly make new recipes (some he loves, some he doesn't) and let months go by between his favorite meals. That's why, when I was planning last week's menu, I thought it was high time I served him up one of his favorites. It's been a while, and he's been very patient. This sandwich is definitely one of his favorites. It's one of the first things I ever learned to cook for him, and he's loved it ever since. Just to prove how grateful he was, he ate three of these last night. Three! Everyone has their own version of this sandwich, and the one I'm sharing with you today is ours, with my own little touches I've added over the years. Usually I use jarred tomato sauce, but last night I used the sauce from this post, and I think it's safe to say that it will be my go-to choice from now on. 1. Bring water to a simmer in a large skillet over medium heat. Add sausages. Drizzle with 1 tablespoon olive oil. Cover and simmer for 10 minutes. Uncover and cook until casings are crispy and sausages are completely cooked through, about 10 to 15 more minutes. 2. Meanwhile, melt remaining tablespoon of olive oil and the butter in a large skillet over medium-high heat. Add peppers, onion, and garlic and saute until vegetables are crisp-tender, about 5 to 7 minutes. Season with salt and pepper, red pepper flakes, and Italian seasoning. Add tomato sauce and heat through. 3. 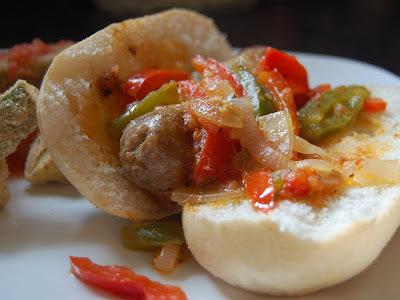 Serve sausages on hoagie rolls, topped with pepper and onion mixture.